Hiking, trekking or adventuring are all outdoor activities that can take you from the park next door to halfway around the world to Tibet. Hikers all over the world have discovered that hiking with trekking poles makes the adventure easier. From adding stability to increasing endurance, the benefits are well known. 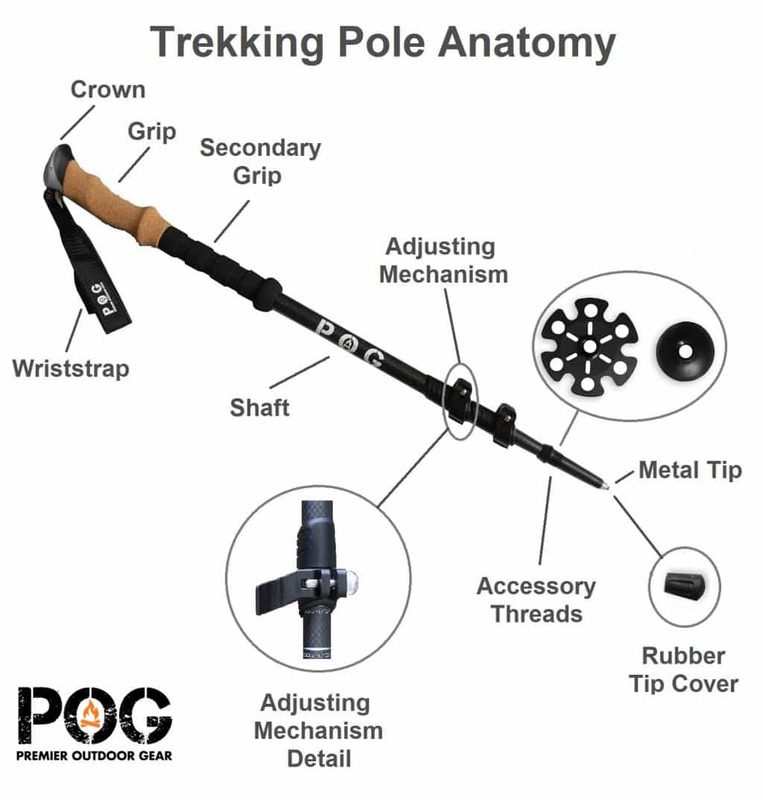 We created the graphic above to acquaint you with the major parts of a hiking pole. * Is placed next to items that are optional, not all trekking poles have them. Let’s briefly discuss each part of the pole. Crowns are the topmost part of the pole, usually flared out to easily keep the pole in position on your hand. The wrist strap usually attaches to the crown. Most hiking poles come with straps. The best poles have straps that are adjustable and padded. Padding is a real benefit for longer distance hikers as they keep hands from becoming chafed. Poles come with a wide variety of grips. Lower cost poles use plastics, synthetic rubbers and foam. Most higher end poles use cork. The advantage of cork is that it prevents chafing and absorbs moisture, allowing a firm comfortable grip of the pole. Top of the line poles offer an extended EVA Foam grip to allow a quick change of grip, effectively shortening the pole on steep terrain. This is a seldom used feature on alot of poles, but it is nice when you need it. The major cost difference in poles comes from the shaft material. The cheapest poles use aluminum. More expensive and lighter weight poles use titanium or carbon fiber. The very best poles use special formulations and weaves of carbon fiber with 3K being among the best for trekking poles. Poles use one of two different types of adjusting mechanisms. The most popular is shown, which is known as a flip-lock. Technically it is known as a cam lever friction lock. It is made up of a cammed lever that locks the “collar” around the pole, with friction holding it in place. There is an adjustment screw that is used to adjust the tightness of the collar. The other type is a twist friction lock, which compresses a wedge type device inside the pole to lock it in place. Most hiking sticks offer some type of threads for screwing on accessories. The most common are baskets discussed below. These accessories keep the pole from sinking too deep into soft terrain. The baskets effectively spread the load of the pole across a greater surface area to keep it from sinking in. Trekking poles come with hard metal tips to penetrate into ice and hard ground to provide a stable contact with the ground. The best sticks have carbide steel tips for penetrating hard surfaces easily. An accessory that protects the hard metal tip when on pavement or solid rock. The tip also provides a degree of grip on hard surfaces. We hope this quick read on pole anatomy has given you a better understanding of poles and can help you speak about them more intelligently. This is a good tip particularly to those new to the blogosphere. Short but very accurate information. Thanks for sharing this one. A must read post!